Posted on Tuesday, July 21st, 2015 at 2:38 pm. It’s been hiding in the wings, but our MobileCaddy CLI v1.0.0 is here! The MobileCaddy CLI is the easiest way to use MobileCaddy to create offline first, robust and versionable mobile applications for Salesforce.com. 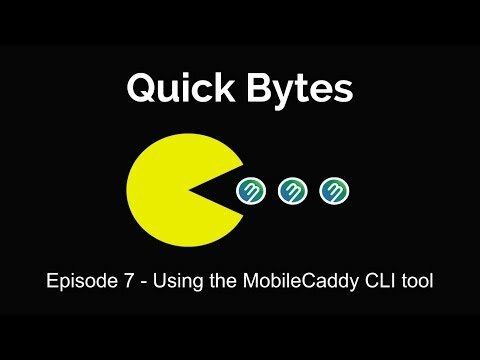 Using the MobileCaddy CLI you can quickly create a project structure based on one of our template applications that will allow you to have a deployable mobile application in a matter of minutes. Too good to be true? Just watch this video where we create a new mobile application using Salesforce.com as a backend. If you’re familiar with accessing SFDC from a localhost environment you’ll know that you have to have a CORS proxy set-up, but not to worry, the MobileCaddy CLI will manage the creation and running of that for you too. The latest release was primarily focussed on stabilising the features we already have, but we also added the capability of defining your own project templates when starting a fresh project. This can be used, for example, if you re-use the same design patterns over-and-over and don’t want to keep re-implementing them on top of the standard MobileCaddy templates (see our Seed and Shell applications). To use a custom template the new command can now be run with a URL that links to a zip file of a project based upon one of the MobileCaddy templates. We currently have two Ionic based templates available… have we mentioned the we LOVE Ionic? What? You’ve not installed it yet? If you want to have a dig into the code the project is over on github. We hope you enjoy it and would love to hear your feedback. Looking for more info? Why not check out our tutorials and you’ll be mobile applications for Salesforce.com in no time at all. If you love being paranoid, revel in bringing order to chaos, are forward thinking, supportive and just a tad competitive….come join us – we think you’ll love it here!